With a strong track record of success, a respectable average return, and a chart that shows that the spread is currently testing price support, the stars have aligned for what we believe to be a good trading opportunity. Therefore, the IMC blog is going to take a hypothetical position on the long side of this spread. Usually, we would wait for some sort of trend reversal before jumping in. But given the fact that today is the start of a high-probability seasonal trade and the fact that the spread is trading at a price that has already been tested a few times with quick recoveries, this seems like a decent place to initiate a position. In addition, the initial small risk size creates an attractive reward-to-risk ratio. So we’re going to go ahead and get after it. For tracking purposes, the blog will make a hypothetical trade by buying one 5,000 bushel May soybean contract and simultaneously selling one 5,000 bushel May wheat contract at $3.56 or better. Initially, we will exit on a two-day close below $3.46. I am new to commodity spread trading. Thanks for the great information. 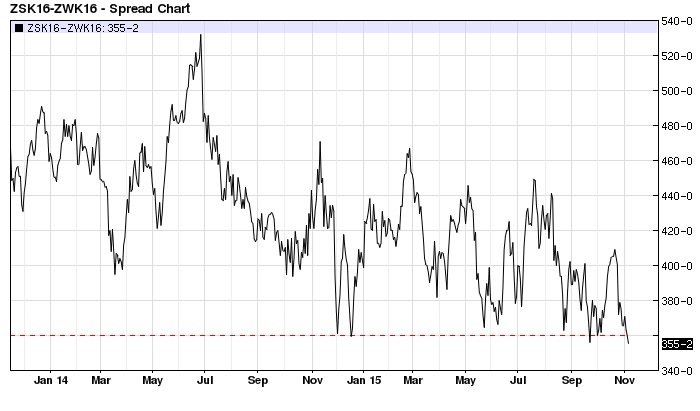 Why is the soybean/wheat spread done on a 1-for-1 basis? I see that the notional value of the soybean contract is much larger than that for wheat. You’re right that the bean contracts have a noticeably larger notional value than the wheat contract. As a matter of fact, it is not uncommon for beans to be worth either side of double the value of wheat. The reason for the 1-to-1 contract ratio, however, is likely due to the fact that the contracts are both the same size (5,000 bushels). Also, the margin is lower than spreading one bean against two wheat. Although the 1-to-1 contract ratio is the norm, don’t let that stop you from viewing/analyzing/trading the relationship with a different ratio. Sometimes, using a ratio of 1-to-2 can equalize the risk and give you smoother volatility. It’s a good idea to look at a spread from several different angles. You may find an opportunity that others are overlooking.